These recent days are packed with a series of great events. 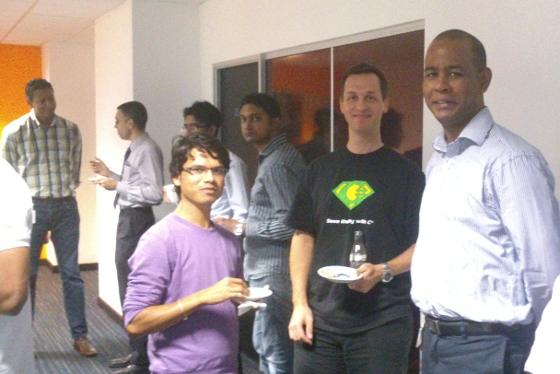 Not only that the Mauritius Software Craftsmanship Community (MSCC) gets more momentum, it's also the situation that there are quite a number of product launches and version releases. 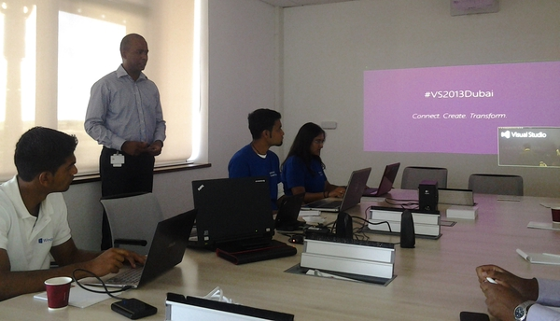 Already last week, the official launch of Visual Studio 2013 happened but quite frankly I couldn't follow the online show as I had a jump start on Microsoft Virtual Academy to attend. 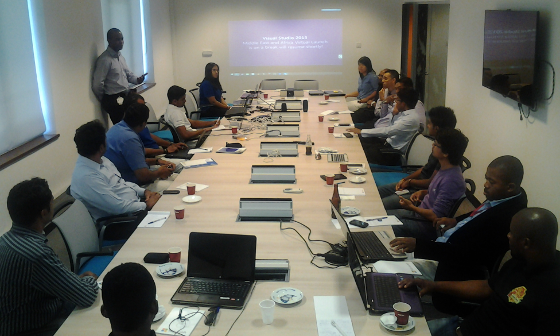 And thanks to Technical Evangelist Arnaud Meslier I had an invitation to participate in the virtual launch event at the offices of Microsoft Indian Ocean Islands and French Pacific, Port Louis. Luckily, morning traffic down to Port Louis wasn't that cramped as usual - well, I guess that might be related that more and more companies are moving their offices into other areas of the island and the capital is starting to 'die'. But don't let us complain about those circumstances. Finding the Microsoft office on the 7th floor of the Dias Pier Building was straight forward, even though it seems that they don't want to be found. Of course, the premises are a huge difference compared to the campuses at Microsoft Germany in Munich or Microsoft HQ in Redmond. Actually, it is more likely to one of those regional offices like in Neuss. "Overcoming some technical issues here and got the opportunity to speak quickly about #mscc. Thanks to @arnaudmeslier"
So instead of everyone waiting Arnaud asked me to give a brief introduction about the Mauritius Software Craftsmanship Community. Thanks for that! Talking about the MSCC provided some interesting follow-up conversations during the breaks later that day. 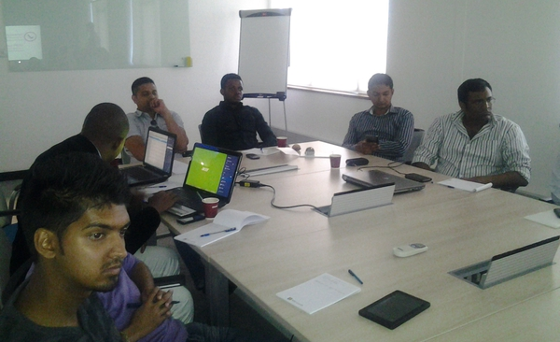 As we started to get in touch with some local IT companies already, it was very positive to have this opportunity. And thanks to a number of students from the Middlesex University, Mauritius we will also try to arrange an appointment with their Dean during the next couple of weeks. Visual Studio One is the successor product to Team Foundation Services, and the online service is (currently) offered for free for teams up to 5 people. This might change in the future but there are no further announcements or any additional information available at the moment. Subscribers of MSDN packages get a surplus on Visual Studio One, and it is also possible to get some benefits as Microsoft Partner. I love this bold statement, and I'm really looking forward to see whether the sprints of the development team(s) behind Visual Studio One are going to able to stick to their word. Actually, it would be pretty impressive to see that finally Microsoft follows some lean practices "Deploy early, deploy often". Oh man, this already gave me a big big smile on the face last week, but once again it was great fun to have this announcement while watching others' faces in the conference room. Microsoft and Xamarin collaborate - read: Microsoft and Xamarin Partner Globally to Help You Build Great Apps - on the support of real cross platform software development for mobiles and smartphones. Seeing the fact that I'm using Xamarin already since last year it's just great to be on the right track. Actually, we spoke about that topic during the last Saturday meetup of the MSCC. Now, that everything is concentrating on cloud-based services and processes it just a natural consequence that Microsoft was also introducing the Release Process which enables you to commit your local source code changes to your version control system - either on TFS or Git technology -, to trigger an automated build process and to deploy to your system infrastructure with a single mouse click operation in Visual Studio 2013. Continuous Integration in a very fine execution. Of course, being a Clean Code Developer there are no real surprises here but it's refreshing to see the high level of integration between the various products in the portfolio of Microsoft. Application Life-cycle got a lot better with VS 2013. "Surprisingly, some of the editor enhancements in Visual Studio 2013 are old fellows when using @TelerikJust JustCode. #vs2013dubai"
Anyway, it's great to see those enhancements as part of the product now, and thanks to partners like Telerik and others there will be more improvements in future versions. Despite the outstanding new products, the high level of integration between Visual Studio, Azure and online automated build systems, the number of long-awaited improvements to the code editor and so on, I really enjoyed the conversations with other attendees during the coffee and lunch breaks. Having a chat with guys from Microsoft, the geeks from the Microsoft Student Partners, some students of the Middlesex University, and other IT people from MCB, Infomil, and more was really awesome. Once again Thank You, Arnaud! In this article I would like to take the chance to quickly summarize the topics we covered and the ideas we worked out for upcoming meetings. And it was also pleasant to welcome more 'first-timers' this month.